Built upon the award winning GuardianOS, the SnapServer XSD 40 offers enterprise class management and data protection features, all in a desktop form factor. Ideal for file sharing and remote access the SnapServer XSD 40 supports SATA-II hard drives and is scalable up to 16TB. The SnapServer GuardianOS includes DynamicRAID for seamless storage expansion by adding or replacing hard drives as capacity requirements change. In addition, all SnapServer storage volumes can grow or shrink dynamically within the storage pool without IT intervention, preventing costly provisioning errors and unnecessary upgrades. With both block and file level access, the XSD 40 has cross-platform compatibility with Windows, Linux, UNIX and Macintosh systems. GuardianOS includes additional data protection features such as high performance snapshots, direct backup to RDX, BitTorrent Sync™ and optional data replication. 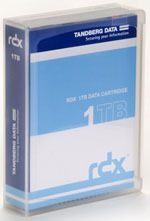 Tandberg Data RDX QuikStor 1TB - Removable Disk Cartridge Part # 8586-RDX 1 TB Disk cartridges - available now at Backupworks.com visit our site or call an account rep today for all your RDX removable disk storage needs. Tandberg with Accuguard. 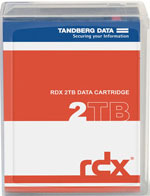 Tandberg Data RDX QuikStor 2TB - Removable Disk Cartridge Part # 8731-RDX 2 TB Disk cartridges - available now at Backupworks.com visit our site or call an account rep today. New RDX 2TB Cartridge 8731-RDX that's up to 4TB Compressed RDX Capacity. 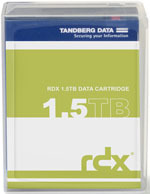 Tandberg Data RDX QuikStor 1.5TB - Removable Disk Cartridge Part # 8723-RDX 1.5 TB Disk cartridges - available now at Backupworks.com visit our site or call an account rep today. 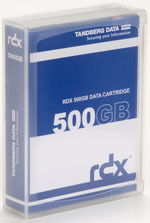 New RDX 1.5TB Cartridge 8723-RDX that's up to 3TB Compressed RDX Capacity. Tandberg Data RDX QuikStor External USB 3.0 Docking Station Part # 8667-RDX removable disk storage - available now at Backupworks.com visit our site or call an account rep today for all your RDX removable disk storage needs. 8660-RDX also Avail.